Every neighborhood needs a good sushi joint. I have three options within walking distance of my place here in Riverside: Sushi Café, Sake House, and Sumo Sushi. I have yet to try Sake House, and because I had a less-than-memorable lunch at Sushi Café that included leathery pork katsu and a bowl of languid sashimi, I won’t bother to review it. (How has this restaurant been named Best Japanese Cuisine in the Best of Jacksonville awards?) But when some sushi-loving friends came in from out at the beach, we decided to hit up Sumo Sushi near the intersection of Park & King. A bamboo fence stretching the length of the windows prohibits sidewalk passersby from having a peak at the dining space, and I’d walked by many a time wondering what lay behind the screen. This element of secrecy heightened my curiosity, and the atmosphere confirmed my suspicions – subdued lighting, Asian décor in warm, natural tones. 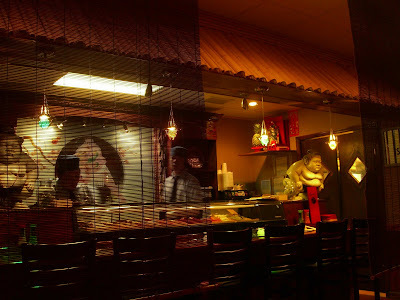 I especially appreciate that diners can sit at the sushi bar and that it is partitioned off from the main dining area by bamboo Roman shades – a particularly clever use of a small space. The bar is flanked by statues of the namesake sumo wrestlers who looked like they’d enjoyed a few pots of chankonabe in their day. As soon as we were seated, one of the two waitresses who attended our table presented us with a ridiculous number of menus. I believe there were something like ten pieces of paper floating around our small table for four, not to mention the daily specials listed on a whiteboard near the entrance. We were glad the servers allowed us time to shuffle through all the options and get our bearings before asking if we had any questions and taking our orders. I ordered a bottle of Kirin Ichiban, a Japanese rice lager that is a standard at most Japanese restaurants in the States. It’s not a beer I would buy to bring home and savor, but I have yet to find a wine that I enjoy drinking with sushi and sake makes me nauseous (drank too many cheap versions from the 7-11 down the street when I lived in Kobe - oops). And, I do like Kirin Ichiban better than Asahi or Sapporo, the other big-name offerings you’ll find on Japanese menus. It doesn’t leave you with much of an aftertaste, just cleanses the palate with a crisp, dry finish… and goes really well with salty edamame. 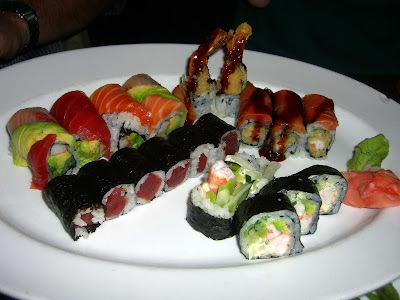 (Image from kirin.com) My sushi expert friends Jenn and Adam went all out on the rolls. From the standard sushi menu, they ordered (clockwise from top left in photo) rainbow rolls (California rolls with tuna, salmon, whitefish, and avocado on the outside); crazy rolls (shrimp tempura with smoked salmon on top and eel sauce); Boston rolls (shrimp, lettuce, and mayo); and tuna rolls. They were pleased with their choices and I was particularly impressed by the large piece of tuna in the tuna rolls – not a dinky pink speck you often get at many sushi joints. They also chose two items from the specialty sushi menu. All the sushi we ordered from the specialty menu was served on a bed of spicy mayo and nitsume (sweet eel sauce). Typically restaurants do this to cover up the taste of less-than-fresh fish, but the quality of fish is high at Sumo Sushi. If you’re not a big fan of the spicy/sweet sauces, you’d do well to request your sushi without them. 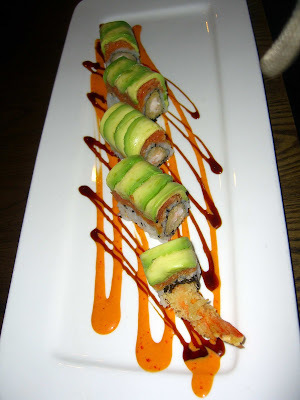 The caterpillar roll consisted of shrimp tempura with spicy salmon and avocado on top. 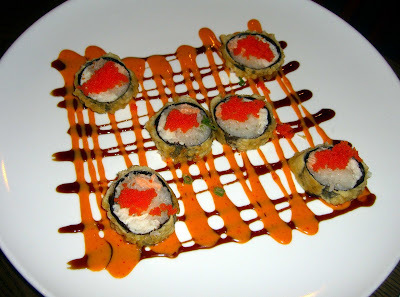 And, the mini me was a tempura sushi filled with crab and shrimp and topped with roe. I had never before tried tempura sushi and think it might get a laugh in Japan, but being the fried-food-loving, spicy-mayo-guzzling American I am, I really enjoyed it. Phil ordered the bento box so he could taste a variety of offerings. 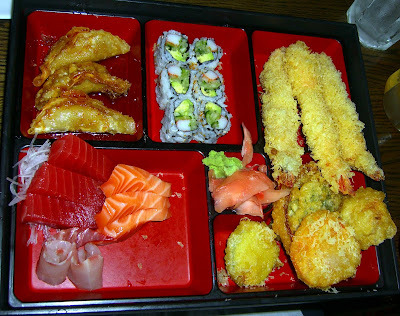 It included shrimp and vegetable tempura, fried gyoza, California rolls, and tuna, salmon, and yellowtail sashimi. The bento was a belly-buster and Phil enjoyed all of the items, particularly the tempura. In Japan, I developed a craving for noodles of all sorts – rich wintry ramen, cold summery soba, and especially fat messy slurpy udon (thick wheat-flour noodles). Most of your run-of-the-mill Japanese places leave noodles off the menu, so I was very happy to see tempura udon on the menu at Sumo. 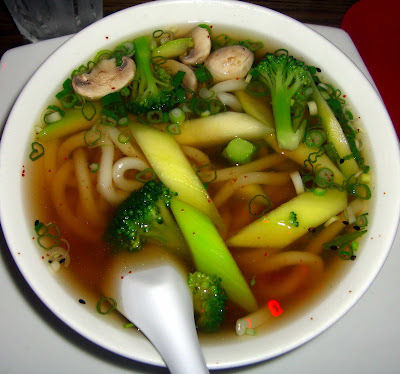 The noodles were swimming in a rich broth with mushrooms, broccoli, and squash, and the shrimp tempura was served on the side so it didn’t get soggy in the soup. In my mind, the Japanese are masters at deep frying and the delicate, airy tempura coating on the shrimp further confirmed this theory of mine. I am sure this will become my go-to takeout dish! I also ordered the Godzilla roll, and the waitress told me it was her favorite roll on the menu and an excellent choice. Well, it certainly was a treat, as much for the taste as for the creative presentation. 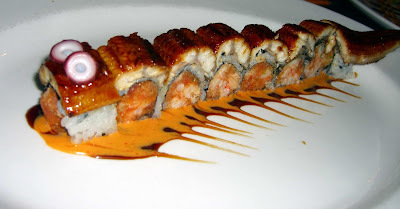 The lobster and spicy crab rolls were topped with unagi (barbecued eel) and shaped like a killer lizard. Cool! I especially enjoyed the rings of octopus the sushi chef used for eyes. As you can imagine, we were stuffed once we finished all this food and couldn’t even fathom dessert. 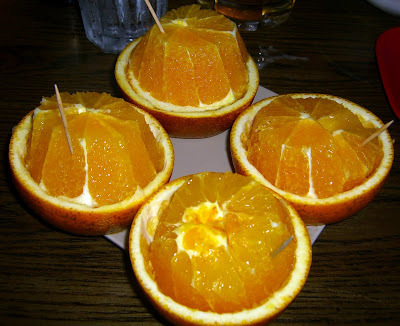 The waitstaff presented us with complementary orange segments when they brought the bill – such a nice touch and a perfect way to end the meal. 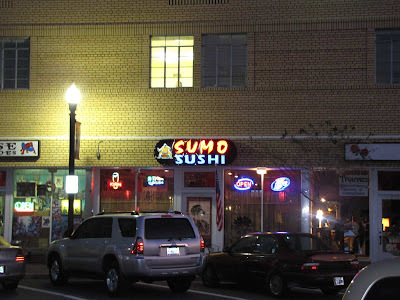 Sumo Sushi is an excellent neighborhood sushi restaurant and is one more reason I love Riverside. The atmosphere is cozy and warm, the fish is fresh, and the presentations are thoughtful and creative… certainly a step above the average joint. I look forward to returning! I have never seen such a unagi. Besides it looks very delicious except udon. I do not like your Udon. We never use broccoli or cucumber in it. But it is a very good idea that Tempura is served outside of Udon bowl. You are tha last lady to find the best and funny thing in the world. 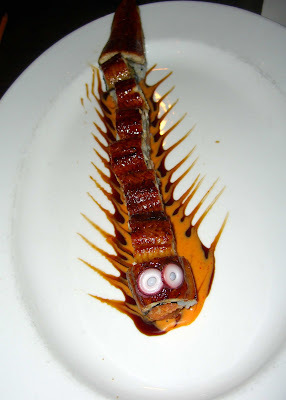 If someone gets its presentation and makes it, I difinitely order the Godzilla Roll. I agree with you about the udon. Tempura udon is one of my very favorite soups and I haven't found a Japanese restaurant here in the U.S. that does it anywhere close to what I used to have in Kobe. However, there was a Japanese place near my apartment in Adelaide, Australia that made excellent tempura udon for a good price... and I really miss it! In general, most Americans, especially those outside of the big cities, haven't learned to appreciate the very subtle and sophisticated flavors that make up a lot of Japanese cuisine (plus, it's sometimes difficult to get certain really high quality ingredients like you find in Japan) so the restaurants here tend to go a bit overboard with spicy mayonnaises and sauces and tempura preparations. I'm sure you've eaten at Japanese restaurants here in the States - I'd love to hear your opinion! I made a terrible English mistake in my comment. I wanted to say that you are a very talented person who find the best and funny things in the world. Agree about tempura udon. Hard to find, marvelous when you do. Haven't really found it done well here in Jacksonville. Providence, RI has a neighborhood called Fox Point which has at least THREE places that serve it well, along with my personal favorite -- ahiru udon (duck). Also, have you been to the only ramen-ya in Jacksonville, over at the World Food Market off Beach? Love that place. The Godzilla roll looks awesome! Two thumbs up for originality and skillfulness! Damn! That's a massive amount of food you guys ate! Our daughter, Melanie, took us here on Sat night -maybe not the best night to test a restaurant- but everything was well done and above par. After spending ten+ minutes absorbed in the menus, I finally ordered the sushi assortment (I got overwhelmed with all the choices - the void of negation thing!). I liked all except for a piece of mackerel - don't know if it was getting "old", or because it had skin on, which I know increases the fishy taste - however, I usually love mackerel! Whatever - we enjoyed this place and the ambiance. Thanks for doing these reviews - hope you continue. @Frederick - THANK YOU for alerting me to the World Food Market - it is on my list for this weekend!!! @SushiTail - yes, the Godzilla Roll was certainly original and the overall winner of the night! @drfugawe - Thanks for the feedback about the mackerel - I think I'll stay away when I return to Sumo. I'm so glad you're finding my reviews interesting! Over the next few weeks I'll be posting about the Lagunitas beer dinner at Kickbacks on 2/1; a wine dinner at Orsay on 2/3; an Ethiopian place called Queen of Sheba; and Chew in downtown Jax. At some point I'll also do a post that includes a number of memorable (both good and bad!) quickies. @Jenn - I love it that you guys aren't afraid to make the HUUUUGE trip across the river. :) Let's try Sake House next time! I think you will love Chew Restaurant. Be sure and get the warm duck salad as a starter, it is big enough for two to share, practically a meal in itself and bewitchingly delicious. And if they have the churros for dessert, get those too, even if you don't have any room in your tummy. Very anxious to hear what you say about Queen of Sheba Restaurant, I assume we can expect the full Cari Treatment when you write your review and post your pictures. @Frederick - we are really looking forward to Chew. Phil & I are celebrating Valentine's Day and 8 years together that Friday night first at Chew and then the Taj Mahal concert at the Florida Theatre. Duck and churros - check, and check!! Based on your terrific photography - we went for lunch last week. Great food and service. Only disapointment - no more godzilla roll.....keep up the great reviews.